This time, it was a short visit, from Cape Town to Kerala. Not a very planned one, but circumstances sometimes do not give you many choices. It was one such circumstance. Now, I'm back in Cape Town. 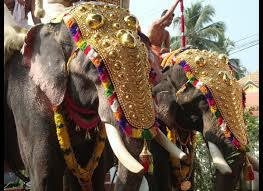 To say something about Kerala, this time, it was the time of festivals in temples and also Christmas. Actually, on Christmas day, I was in the plane-Emirates Airways. I thought, being the X-mas day, plenty seats would be left vacant in the plane, the majority travellers being believers who might want to keep indoors on the day Jesus was born into this world. It was just my presumption, not based on any study, but, I was wrong. Not a single seat was left vacant.